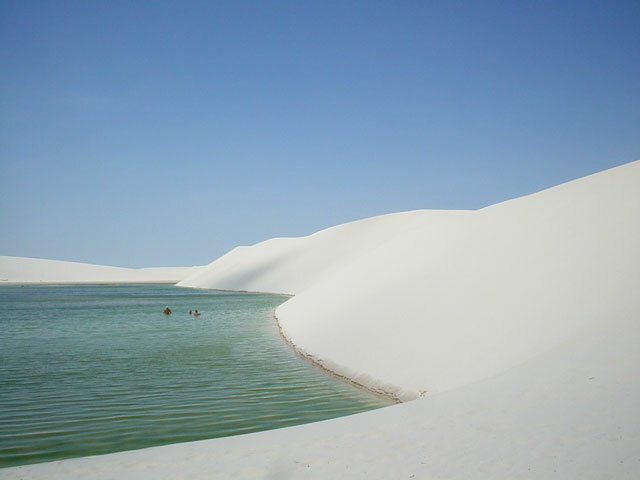 Day 1: From Jericoacoara to Parnaiba. 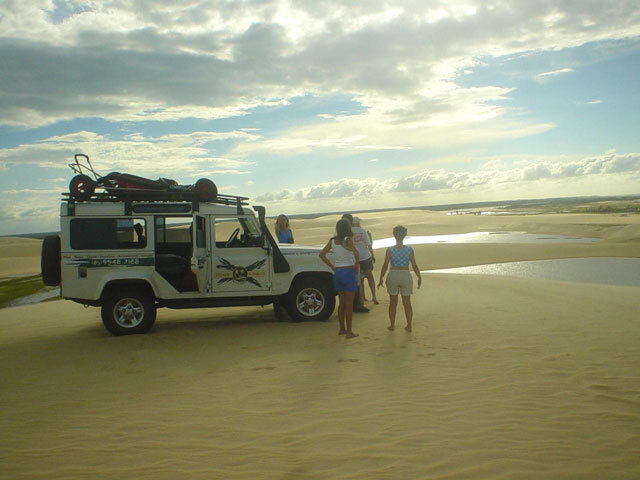 We leave Jericoacoara by the morning, following the coast and the beaches of Mangue Seco, Guriu (river cross) and Tatjuba where we visit the ruins of the sand-buried old village, the beautiful dunes and the lagoon. We keep along the coast as we reach the "Ilha do Amor", close to Camocim (another ferry) and we reach the city. There we take the road to Parnaiba (about 1 and a half hour). Arrival at Parnaiba in the end of the day. At night walk around Porto das Barcas, where you can visit small handcraft shops and restaurants serving the typical dish: Crabs..
Day 2: The Delta of Americas and the Lencois Maranhenses. In the morning we leave the hotel and go to the Port of Tatus, where our boat will departure for the great adventure of the day, the boat trip through the arms of the Delta. Nature at it�s pure form. 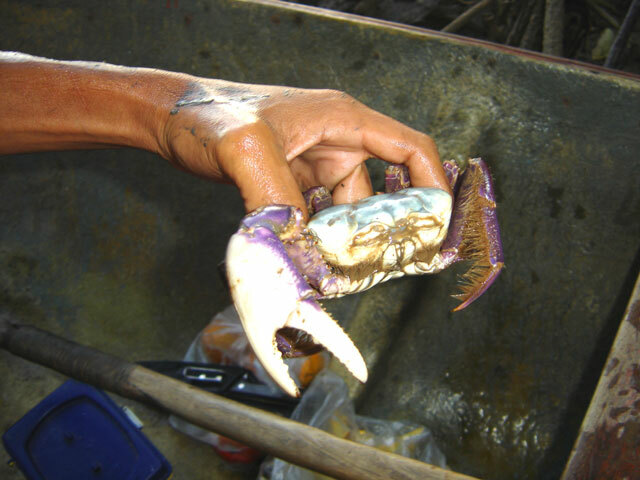 Depending on our luck, we can see crocodiles, iguanas, monkeys, snakes at their wild habitat, the exhuberant mangroves. We can lunch on an island at the Delta or back at Parnaiba. In the afternoon we go to the state of Maranhao. 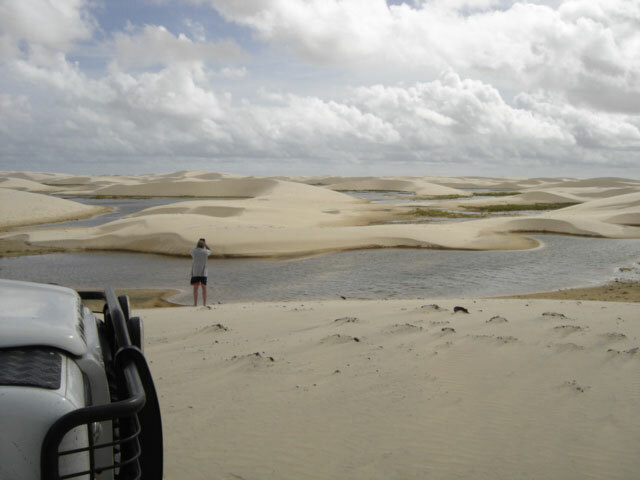 To get to Barreirinhas there�s no road, only soft sand tracks. Along the way we are blessed with the dunes of the "small lencois", making this part of the trip unforgettable. Arrival in Barreirinhas after the sunset. Today, visit the Preguicas River on fast boat. 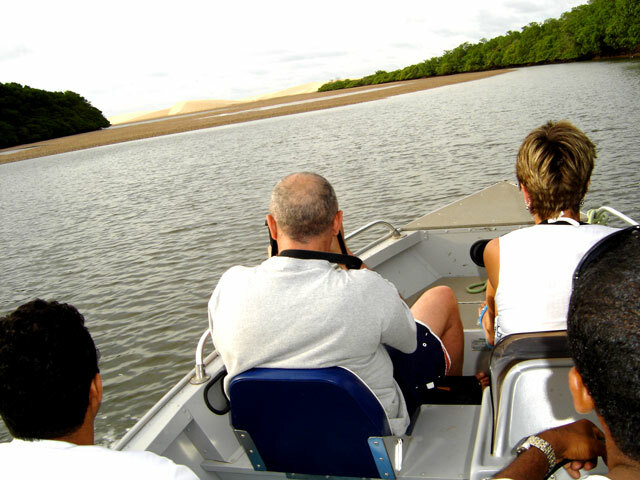 On the way to the peninsula of Cabure, a piece of sand between the ocean and the river, we�ll see lots of different palm trees, birds, even monkeys. 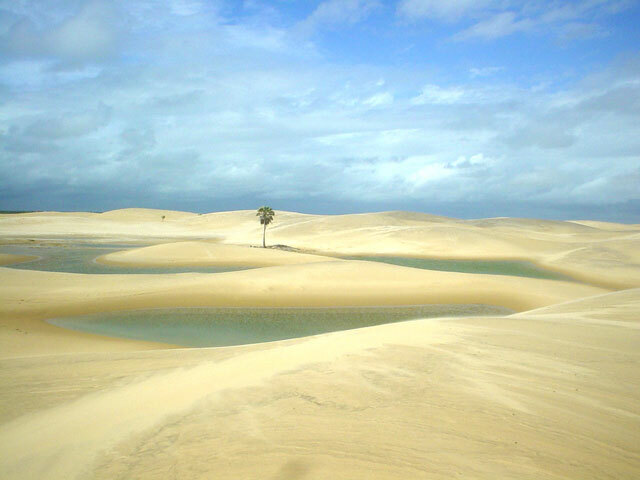 Aftr lunch, return to Barreirinhas to visit the dunes and lagoons of the National Park of Lencois. 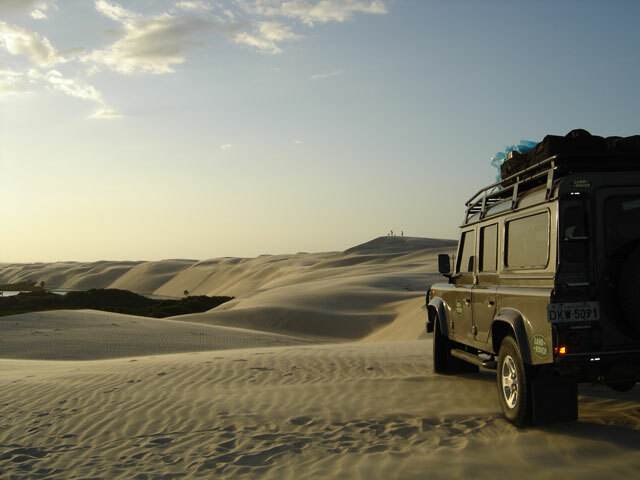 After the sunset on the dunes, return to Barreirinhas for handcrafts shopping, dinner and rest. Day 4 : From Barreirinhas to Camocim. After breakfast, we suggest a flight (optional) over the Park to figure it�s immensity. Then we leave to the small lencois again untill Rio Novo and from there to Parnaiba, where we stop for lunch. In about 2 hours we get to the resort in Camocim. Day 5: Camocim to Jeri. A quick stop at the market for some fresh fruits and we cross the boat for our off-road trip along the beaches untill we get back to Jericoacoara.